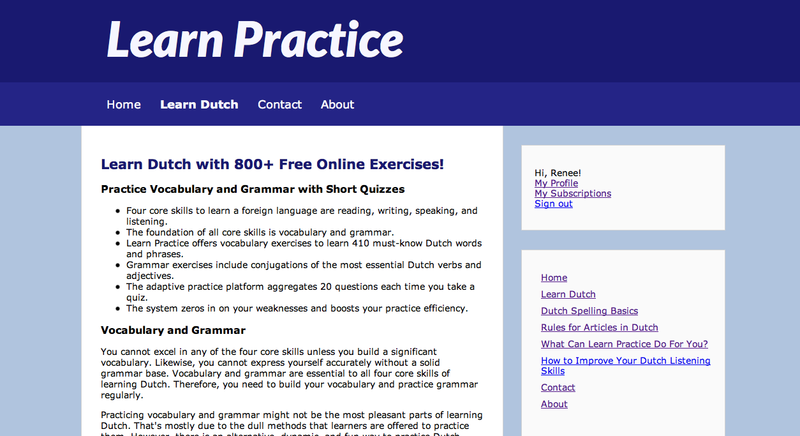 I recently received an email from Burak Bilgin who let me know about his website LearnPractice.com for the Dutch Australian links page. After trying it out myself, I thought it was worth a blog post to highlight this great tool for those learning Dutch. What I liked most was the instant feedback. When I’m learning, I like to know immediately what I’ve done wrong, or what I have right. When you have a correct answer, you go straight through to the next question, with “That was right” on the top of the screen (referring to the previous question). At the end of a quiz, it will summarise your score. I also like that this was based on questions I had right the first time – not including the ones I corrected myself on with assistance. It also shows a summary of my incorrect answers, giving me a good base to revise. As I write this, I’ve only taken one quiz but I can see this is a handy tool I’m likely to return to regularly and wanted to share it with those who are learning Dutch. Good luck! I’d love a comment below if you have tried out this website to hear how you went. Thank you very much for taking the time to review LearnPractice.com. I really appreciate the encouraging feedback. It is also very interesting to read what you liked about it. This helps me to identify which features are the most valuable for end-users, so that I can develop more similar features. I am also looking forward for the comments of the Dutch Australian community. That helps a lot to improve a website like LearnPractice.com. I truly appreciate your efforts.